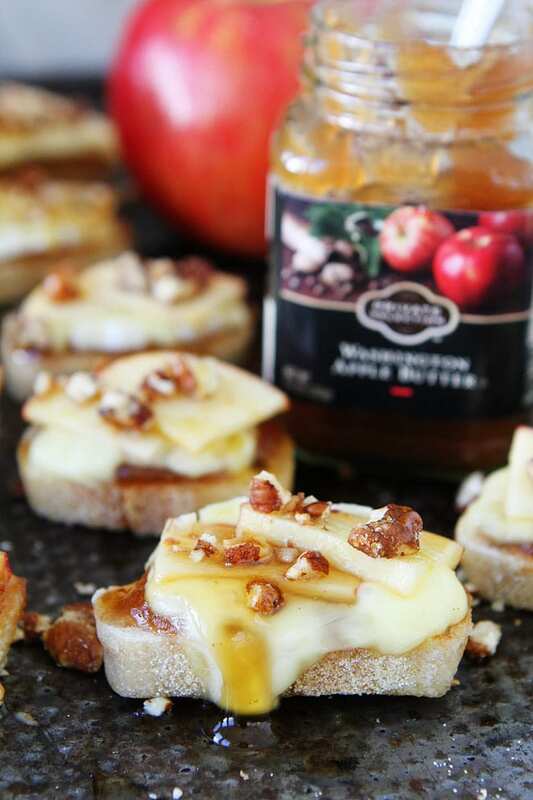 Brie, Apple, and Honey Crostini-this easy appetizer is perfect for holiday parties! It takes 15 minutes to make and everyone loves it! The holidays are right around the corner and today I am sharing my “go to” appetizer. 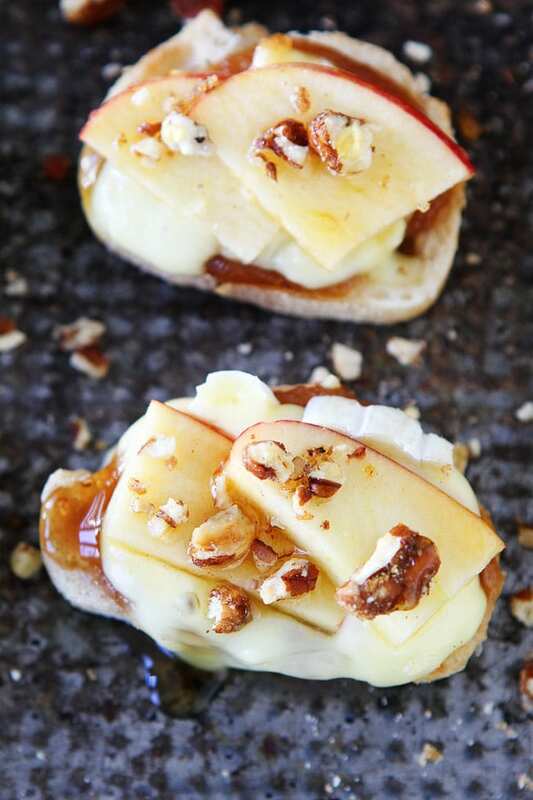 This easy Brie, Apple, and Honey Crostini is SO easy and party goers always ooh and ahh over it. I always love watching my friends and family take a bite for the first time. It is one of those recipes where people close their eyes and say: wow, yum, mmmm, so good, amazing, and some even make weird noises, which is kind of awkward at a party, but this crostini is THAT good! And they love it even more when they find out how easy it is to make! A few weeks ago, I went to Cincinnati for a blogging event with Kroger. We have been working with Kroger this year so it was fun to see the headquarters, meet with the Kroger team, and spend time with the other Kroger bloggers. Kroger asked every blogger to prepare a recipe for a holiday meal. We all shopped, cooked, and ate together and it was so much fun. We used the new ClickList program to do our grocery shopping. We ordered our groceries online and then picked them up at the Kroger store. For the holiday meal, I made my favorite Brie, Apple, and Honey Crostini. I knew it would be a hit with the group! So let’s talk about how easy this recipe is. I told you easy and I mean EASY. The appetizer starts with a baguette, but I don’t even have to slice it because I always buy the perfectly sliced baguette at Kroger (Smith’s in Utah). Next, I spread apple butter on the bread slices. I don’t make the apple butter, I totally cheat and use Private Selection Apple Butter. It is perfectly spiced and tastes amazing. On top of the apple butter, I place slices of creamy Murray’s Cheese Brie. I place the crostini in the oven until the brie gets all melty and gooey. 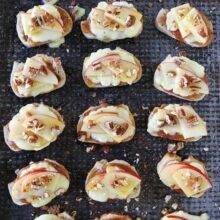 Remove from the oven and top with candied pecans and a drizzle of honey. At home, I use my homemade candied pecans because I always have them on hand, but at the event I used Private Selections candied pecans and they are really tasty! Kroger really does have everything! At the event, I also tried Private Selection’s Vanilla and Nutmeg Infused Honey and oh my goodness! It was the perfect ending to my crostini. If you can’t find it, any honey will do, but that honey is amazing! 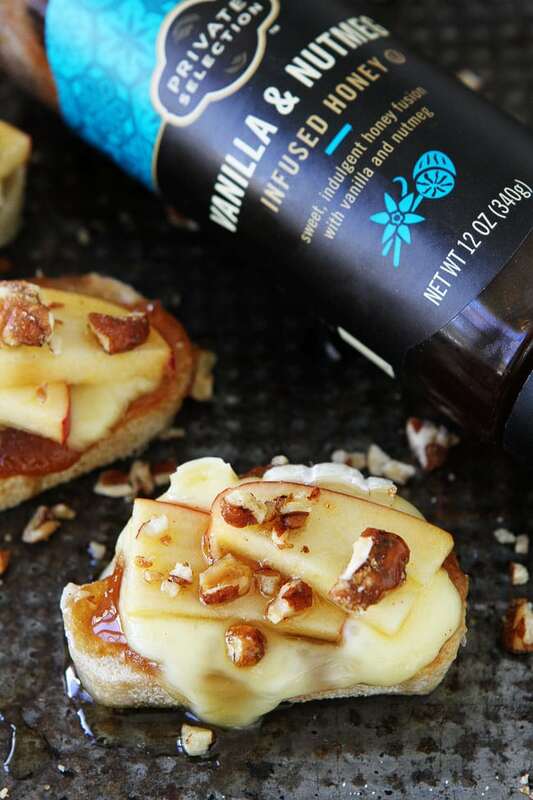 The Brie, Apple, and Honey was the perfect start to our holiday feast! Everyone loved it. And let me tell you, when a group of bloggers makes a holiday meal, you leave very full and very happy. I was amazed by all of the creative and delicious dishes. I wish we could make dinner together every night! 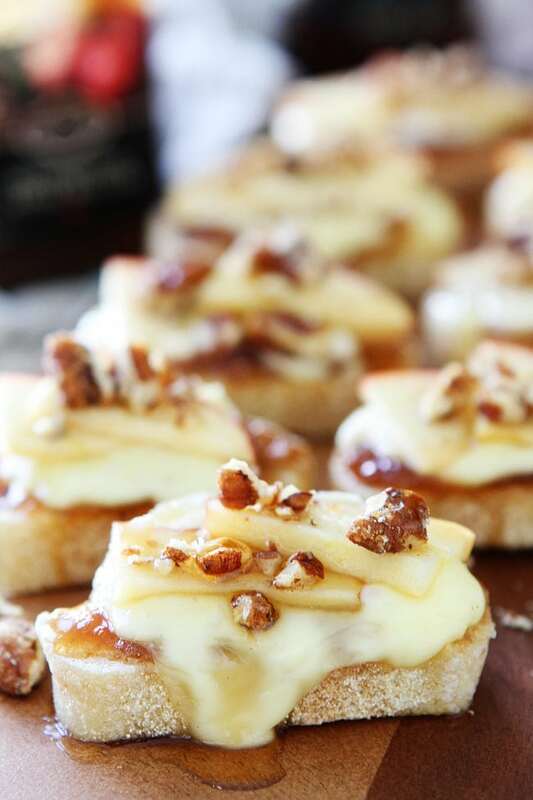 This easy Brie, Apple, and Honey Crostini is the perfect holiday appetizer. It takes about 15 minutes to make and your guests will be raving about it until the next holiday season. Add it to your holiday menu NOW! This easy appetizer only takes 15 minutes to make and will be the star of any party! Yummmmm! Next week I’m meeting with a friend and we’re going to do a tapas style dinner – I’ll definitely put this on the list 😉 Looks delicious! This recipe is perfect for your tapas dinner. Have fun! 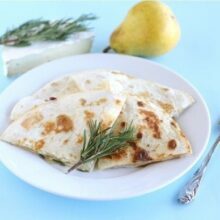 LOVE the combo of apples, brie, and honey together! it’s magical! What a perfect easy fall appetizer!!! I’m thinking plain instead of candied pecans, since you’ll be adding honey on top. I’ll be sure to bring this app to the next party we go to! I can’t think of a better flavor combo than this!! Made these for a Thanksgiving party and they were quite a hit! I didn’t have time to candy the pecans so I just chopped up some raw ones. Still very good. Thanks for a simple yet elegant appetizer idea! does it matter what creaminess level of brie you use? No, use your favorite! All work well. Been making these for a few years but I use phillo cups instead. Next time I’ll give the crustini bread a try. One of my favorite go-to appetizers. Made this again tonight. Love it!!! I used goat cheese and it complimented it so well! I made these for a summer porch party at our local Historical organization. 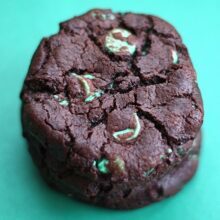 Everyone loved them and wanted the recipe. I made a few changes; I used goat cheese, French bread, and apple jelly instead of apple butter. I only made these changes because I couldn’t find the required ingredients.. Thanks for a wonderful recipe! Love your adaptations! Glad the recipe was a success! What if you can’t find the particular apple butter you listed? Will regular apple butter suffice? Really excited to make these! Yes, you can use your favorite apple butter. Hi there, In the print version of the recipe it says to put the apples on once the crostini’s come out of the oven. But it doesn’t mention this in the illustrated version. 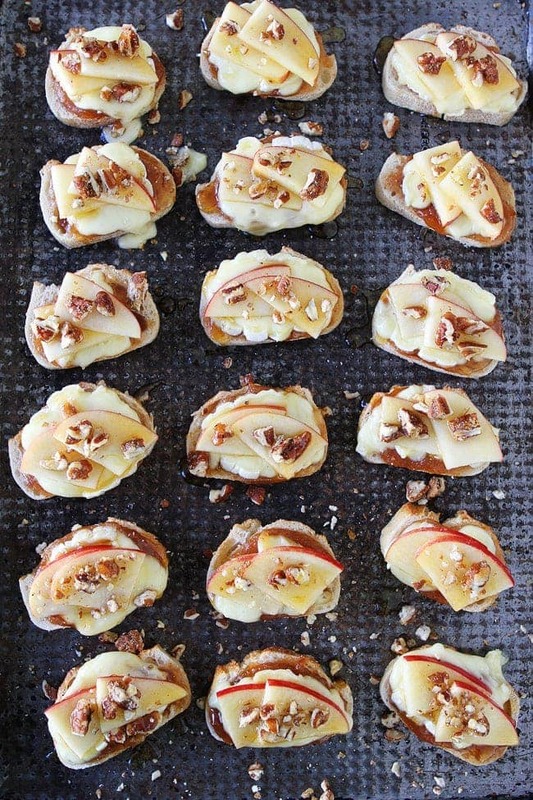 It looks like the apples went into the oven and melted into the cheese in the pictures. I am looking forward to making this recipe tonight for my cooking club and I want to represent it properly. Thanks so much for any advice. You put the apple slices on after the crostini comes out of the oven and the cheese is melted. Enjoy! I was wondering if I could assemble the apple butter and Brie ahead of time – a few hours . So it would be ready to pop into the oven. We don’t have krogers in upstate ny. Any other suggestions for the apple butter and infused honey?? Mouth-watering pictures! A must try for sure. I linked here on my recent post over and Hampers & Hiccups. Find the link below. I just stumbled on this recipe and am suddenly starving. I want to take this to my sister’s house for Thanksgiving. I’m on the list for bringing an appetitizer. Have you ever prepared this one ahead to travel? Delicious and easy and all gone! This looks really easy and quick if you are the host . However I don’t think it is something you would make ahead to bring to an event you are attending. None the less, I will have try it when i’m entertaining. Any suggestion on what kind of apple compliments the best? Honeycrisp or Fuji are my favorites! 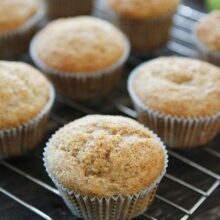 This recipe is as easy as promised and twice as delicious. This is my new go-to appetizer! I roughly chopped some Private Selection praline coated pecans and they were perfect. Enjoy! You forgot to mention the apples on top! I had already decided to make this appie when i found out my brother in law was making a prosciutto wrapped date. So two sweet appies was not what people wanted. So in order to cut the sweetness of this one i swapped out the honey for balsamic vinegar reduction. It was amazing to add the tartness to this dish. It was a huge hit all round! Try it you will love it! I made this last night for a party and it was a huge hit! It was so easy to throw together at the last minute. I made the candied pecans earlier in the week, I was lucky to have some left for this appetizer because I could not stop snacking on them. Thanks for the great recipes! I made these for game night and everyone loved them. I will definitely make again. Delicious.